Hyperion is an irregular outer moon of Saturn, with a mean radius of 133 km. It has a low mean density, suggesting that it may consist primarily of water ice, with an unusually porous interior, resulting in a bizarre, sponge-like appearance. This false-colour view of Saturn's moon Hyperion reveals crisp details across the strange, tumbling moon's surface. Differences in colour could represent differences in the composition of surface materials. The view was obtained during Cassini's very close flyby on 26 September 2005. 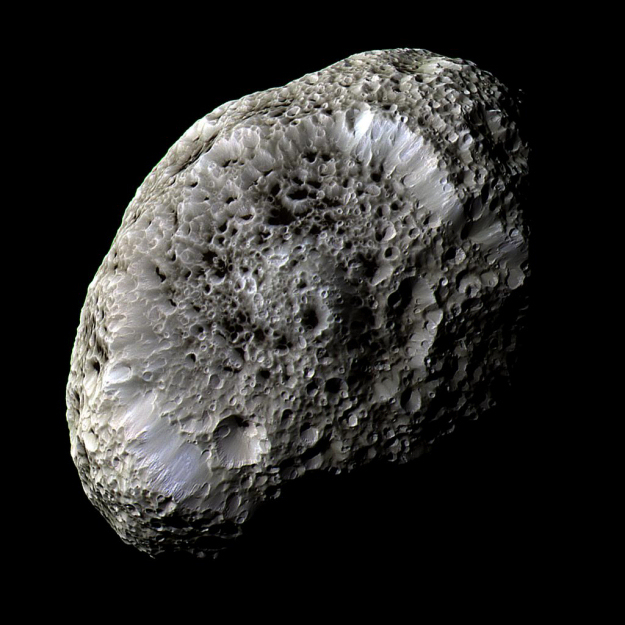 Hyperion has a notably reddish tint when viewed in natural colour. The red colour was toned down in this false-colour view, and the other hues were enhanced, in order to make more subtle colour variations across Hyperion's surface more apparent. Scientists think that Hyperion's rather odd appearance can be attributed to the fact that it has an unusually low density for such a large object, giving it weak surface gravity and high porosity. These characteristics help preserve the original shapes of Hyperion's craters by limiting the amount of impact ejecta coating the moon's surface. Impactors tend to make craters by compressing the surface material, rather than blasting it out. Further, Hyperion's weak gravity, and correspondingly low escape velocity, means that what little ejecta is produced has a good chance of escaping the moon altogether. Images taken using infrared, green and ultraviolet spectral filters were combined to create this view. The images were taken with the narrow-angle camera at a distance of approximately 62 000 kilometres from Hyperion and at a Sun-Hyperion-spacecraft, or phase, angle of 52 degrees. The image scale is 362 meters per pixel.